The Kinglake Chimney which is now part of the Museum Victoria collection of items from the Black Saturday Bushfires. The Age, 21/6/2009. Day three of sessions at the Australian Historical Association conference started with disasters. No, nothing awful befell the historians ensconced at the University of Adelaide. Rather, the subject of the plenary panel in the morning was ‘Disasters in Social and Cultural Perspective: Impact, Response, Memory’. Archives, museums and libraries around Australia have done tremendous work to preserve collections and collect memories of the recent disasters. It was therefore fitting that we heard first from Liza Dale-Hallett of Museum Victoria. She discussed the Museum’s work with the victims of the Black Saturday fires of 2009 through the Sustainable Futures project. She argued that the experience of the bushfires was a gendered one. As Mike Jones observed on twitter, Dale-Hallett raised “interesting issues of identity and belonging”. There have been so many other valuable projects like the Museum Victoria Sustainable Futures project. As I was listening I was thinking of the ABC Open’s ‘Resilience: Disaster, Resilience and Recovery‘ project and the State Library of Queensland’s work on the Floodlines project to name but two of the many such projects around Australia. A perceptive question from the audience revealed that those who work to record memories of disasters, such as Dale-Hallett, can also suffer from stress as a consequence of many hours listening and recording the experiences of the victims. It reminded me of the difficulties of the ABC journalist who had worked in Aceh immediately after the tsunami and who subsequently suffered from post-traumatic stress disorder. Professionals who deal with recording memories of recent disasters need to be looked after. An interesting inclusion in the panel was a psychiatrist, Professor Alexander C McFarlane from the Centre for Traumatic Stress Studies, University of Adelaide. His participation showed the benefits to be gained for historians by engaging in inter-disciplinary (and inter-professional) interaction. He said that his work in some respects was very similar to that of historians – he documents disasters and acts as an expert witness. He urged historians to examine the class actions that are often launched in the aftermath of a disaster. McFarlane’s comments about the use of language in the wake of disasters were illuminating. “Traumatic experiences are hard for language to capture”, he remarked. He spoke of the silence of victims of disasters in the immediate aftermath and the frequent comments of victims that words could not express the experience. 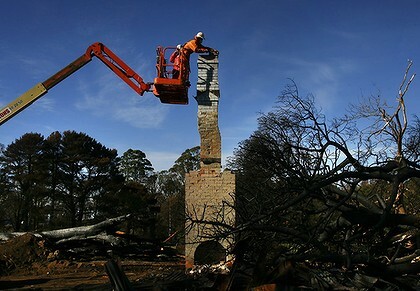 This made me think of Museum Victoria’s work to preserve memories through symbolic artefacts connected with the Black Saturday bushfires, such as the Kinglake Chimney. Maybe the object without language is as good at conveying memories and communicating about the disaster? McFarlane was emotional about the subject, in particular about the issue of learning from past disasters. Why have we not learned from the previous disaster experiences in Australia, he asked. His answer – language fails to express the disaster experience. He urged historians to research this issue. Historians were included on the panel. Professor Charles Zika of the ARC Centre of Excellence for the History of Emotions at the University of Melbourne discussed ‘Reading Disaster in Early Modern Europe’. Disasters of course are not just a modern experience. He argued that each disaster become a particular experience not only because of the presence of a destructive agent but because of the social and cultural conditions that are present at the time. Zika said that disasters can often be seen by us today to lead to disenchantment and a move away from religion. This attitude is a manifestation of the secularisation thesis which is used to argue why religious beliefs will eventually disappear. We need to be careful about this attitude. He said that in early modern Europe people had a rational response to disasters such as the construction of dykes in the Netherlands, but they also drew on religious beliefs. He mentioned days of atonement and prayer in the aftermath of disasters. I have also come across such days in nineteenth century Australia. Zika’s current research is on a collection held in Zurich of early modern images and documents concerning disasters. Why were disasters memorialised in this way? Zika argues that this collection was an instrument for coping. The work of Dale-Hallett at the Museum of Victoria has a long lineage! The other historian on the panel was Maria Tumarkin who gave an engaging and absorbing presentation – unfortunately I did not catch the title. She also acknowledged the culturally specific nature of disasters and the expression of grief, noting that her comments were specifically about the western experience. She stated that grief has always been part of life and has always had a public life, but that the public life of grief has changed recently. Now spontaneous public memorials are a normal response to tragedy. We grieve with and through objects and place. These often replace absent bodies. Spontaneous memorials and other new rituals of grieving are replacing traditional religious expressions which for many people no longer meet their needs, she remarked. Tumarkin commented on an emerging genre of writing – the grief memoir. I have one at home written by residents of Far North Queensland in the aftermath of Cyclone Yasi, but I didn’t know that this type of book was a recognised genre. Tumarkin commented that grief memoirs were replacing manuals on coping with grief written by ‘experts’. This is a familiar refrain that I have heard often over the last few years. It is yet another example of the democratisation of knowledge and the challenge to the authority of professionals traditionally regarded as experts. Grief memoirs are changing the public discourse of grief observed Tumarkin. “The era of ‘getting over’ grief is over”, she stated. I was tweeting furiously during this session and intensely absorbed in it, becoming emotionally involved as it invoked recent memories of disasters. I have endeavoured to faithfully record the session, but during Zika’s talk I tweeted that I was having difficulty keeping up. I would love to read the papers that were delivered. If the speakers or those in the audience have any corrections to the above account, please record the corrections needed in the comments below. And of course, I would love to hear your reflections on this new field of history. This entry was posted in Australian Historical Association, Conferences, Place and Environment and tagged Australia, Bushfires, climate, Cyclones, Floods, History by perkinsy. Bookmark the permalink. Very intereesting post Yvonne, and I saw your tweets. Thankyou June! I’m glad I remembered your twitter handle. I was tweeting by mobile phone and it was too hard to search handles while tweeting. Your’s was one of the very few I remembered. I’m interested to see your references here to tweeting in the conference, and I’m wondering about the impact on how you absorbed the content. I’ve done live blogging at writers festivals and conferences and found that it’s impacted a bit, better in some ways because in some ways it’s much the same as taking notes, but an impediment in others because I’ve paused to proof-read before pressing Update and then I’ve missed something that was said. What do you think, now that you look back on it? I found it was just like taking notes and as with taking notes I did make the odd mistake. This does happen on twitter when people are doing live tweeting whether at an event like a conference or in the midst of a natural disaster (I read some very incorrect tweets during cyclone Yasi). However, any decent tweep will correct errors as soon as they noticed they have tweeted incorrectly – which I do. This is where the community of tweeps are so good. In the case of this conference the error that I made was very quickly noticed by other tweeps in the session who corrected them. I noticed the corrections and was able to tweet a correction myself. Towards the end of the conference I became very tired, partly because the tweeting requires great concentration so I found myself tweeting less and handwriting notes more. I think others were also tiring. I was also blogging the conference, trying to write a blog post at the end of each day. By the end I was exhausted and I think had fallen behind the blog schedule I had set myself. However, this was a self-imposed goal so I didn’t worry too much about that. Conferences require stamina just being in the audience. Tweeting and blogging them requires even more. It is a good idea to be very well rested going into it! Looking back I loved every minute of it and I would do the blogging and tweeting again. Australian historians are doing wonderful work. I am glad that I played a small part in promoting this to interested people who could not attend the conference. Yikes, I’ve just thought of something to make myself even more nervous at a session I’m presenting at the upcoming Stonnington Festival. What if people are tweeting? They will be, won’t they, yikes and double yikes! Yup – they should be tweeting! But from what I’ve seen on twitter the audience is generally sympathetic to speakers. They wouldn’t be listening if they didn’t want to hear what you have to say. What are you speaking about? Sounds interesting… and a lot of reading! You should advertise the session on twitter a few times closer to the date. The theme of the festival is [untitled]: our writers, readers and stories.